A mother goes to market. While she is gone, a witch persuades her children to let her in the house. The witch turns the children into her supper, but the mother arrives home in time to save her children and chase the witch away. 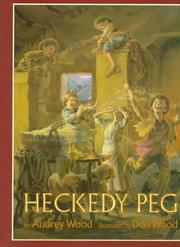 Wood, Audrey, “Heckedy peg,” Children's Picture Book Database at Miami University, accessed April 24, 2019, https://dlp.lib.miamioh.edu/picturebook/items/show/9898.